File image of Nagaland Pradesh Congress Committee President K Therie. Nagaland Pradesh Congress Committee (NPCC) on Wednesday came down heavily on Prime Minister Narendra Modi alleging that the latter has destroyed every constitutionally-established institution. The NPCC also accused the Prime Minister of dividing the country on the basis of religion and class adding that the love, respect and understanding for the minorities’ voice, has also been ‘brutally crushed’, according to reports. 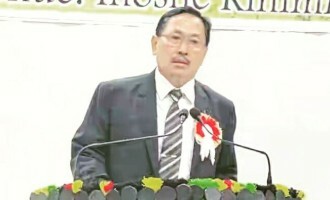 NPCC president K Therie while welcoming BJP, NDPP and NCP members into the Congress at a function held at the Congress office in Kohima on Wednesday alleged that secularism and freedoms enshrined in the Constitution of India were all under threat today. He further alleged that BJP was blindly driven by the ideology of establishing a Hindu nation, while totally disregarding other religions and sections of the country. On the Naga political issue, Therie reiterated Congress’ stand to solve the vexed problem through peaceful and constitutional means. Therie further said that the Lok Sabha candidate for Nagaland from the party would be announced after due consultations with like-minded parties and leaders.